The game of Xiangqi (literally translated as ‘elephant game’) is old, how old is difficult to be sure about. There are mentions of Xiangqi as far back as the Qin dynasty, but these may not refer to the same game. There is a description of a similar game in a book titled ‘象经 xiàng jīng’ dated about 569CE. The game is probably described in the (玄怪录 Xuán guài lù ➚ Record of the mysterious and strange) in the Tang dynasty, however it is not until the Song that details of the board and pieces are recorded. Sets of metal pieces have survived from these days but no board has yet been found. It is possible that a common precursor to Western chess and Chinese chess developed from an early form played in India ➚. It is also likely that a range of chess-type games evolved in different regions for centuries before becoming standardized. A three player version with three sets of 32 pieces was played at one time to honor the battles of the Three Kingdoms Period. Chinese chess is closer to the ancient game of chess than ‘modern chess’ in terms of names of the pieces and the moves. 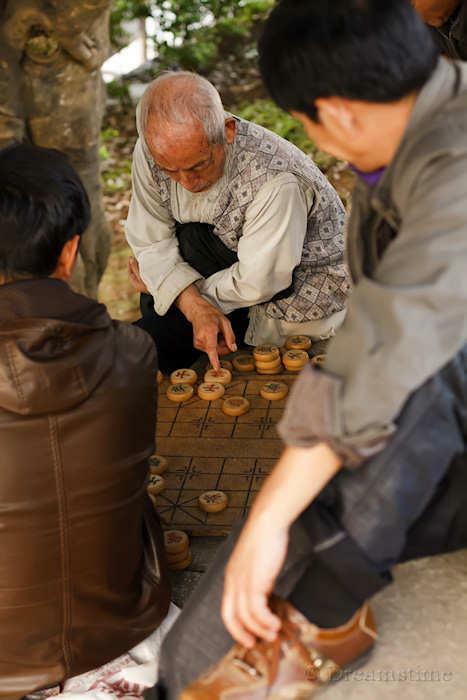 In China, chess is considered one of the ancient arts and is traditionally played at tea houses. Pieces move along a grid of 10x9 lines rather than in squares. There are sixteen pieces on each side. Nowadays the pieces are of wood or plastic; in ancient times they were metal discs ➚. The board can be just a piece of paper or marks on the ground. The grid has a central division called the 河 hé River, which serves as a barrier to the elephant piece that can not cross it. The two sides are black (or sometimes green) against red. On each side of the river is a (宫 gōng fortress or palace). The generals and scholars are restricted to move only within their own fortress. The fortresses are indicated by diagonal lined areas. In the full traditional set described here the characters on all the pieces are different; this allows moves to be written down without having to identify which side. A black soldier 卒 zú or red soldier 兵 bīng moves forwards one step at a time until it crosses the river when it can then also move sideways one step. It is broadly similar to a pawn, but it does not get promoted when reaching the end line and it cannot take ‘en passant’. A soldier captures in the direction of travel not diagonally, so it attacks the piece in line. Each side has five soldiers. The chariot or carriage 車 and 俥 (both pronounced jū) moves in straight lines forward, backwards or sideways any number of steps. It is very similar to the castle or rook in Western Chess. Each side has two chariots. The black horse 馬 mǎ and red horse 傌 mà moves one step forwards, backwards or sideways and then one step diagonally as with the Western Chess knight. However it may not jump over another piece as it can do in Western Chess. Each side has two horses. The black catapult 砲 or red cannon 炮 (both pronounced pào) moves in the same way as the chariot. It is different in the manner it captures pieces as there has to be one intervening piece for it to take in that direction. This greatly adds to the complexity of the game, as moving a piece out of the way of a cannon's attack can counter-intuitively render defense to other pieces. Each side has two cannons. The black elephant 象 or red minister 相 (both pronounced xiàng) can only move two steps diagonally. It is a defensive piece as it can not leap over other pieces or cross the river. These restrictions mean that there are only seven places that an elephant can occupy. In a rather vague way it is a bit like a restricted bishop in Western Chess. Each side has two elephants or ministers. Chinese chess is known as 象棋 Xiàng qí meaning literally elephant game. Xiangsounds the same as 想 which means ‘think’ or ‘ponder’ which is very appropriate. The black adviser 士 or red scholar 仕 (both pronounced shì) is restricted to move one step diagonally and only within the fortress (or palace). There are only five spaces it can occupy and its role is defensive. Each side has two advisers or bodyguards. The chief piece on the board is the black General 將 jiàng or red Marshal 帥 shuài (simplified form 帅). It can move only one step forwards, backwards or sideways within the fortress (or palace) but not diagonally. 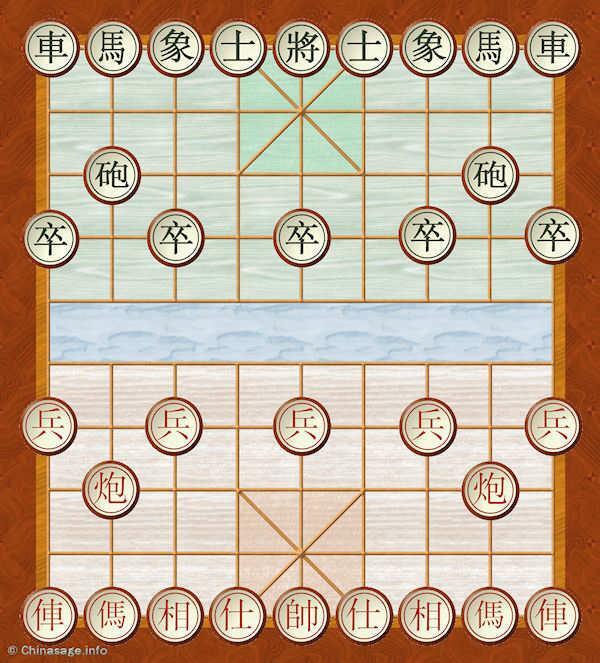 The game ends when a general is put into check (attacked by an opposing piece 将 jiàng) and can not move out of check (checkmate 将死 jiāng sǐ). The General resembles the king in Western Chess. There is an additional rule for generals which is that the two generals must not face each other on the same line with no pieces in between. This is a special form of ‘check’ and often results in checkmate. The initial layout is the same for each side, five soldiers are spaced on alternate lines one step back from the edge of the river. The two cannons are placed on the line one step in from either edge. The bottom line is laid out as chariot; horse; elephant; scholar; general; scholar; elephant; horse and chariot. This makes a total of sixteen pieces. By tradition red starts first. The most common opening is to move the right cannon left to the central line, protecting the general and threatening the opponent's general. It is called 当头炮 dāng tóu pào ‘equal head cannon’. The normal response by black is to move their left horse in front of their left elephant. This move is called 马来跳 mǎ lái tiào ‘horse arrive leap’. There are many names for standard openings, moves and strategies. 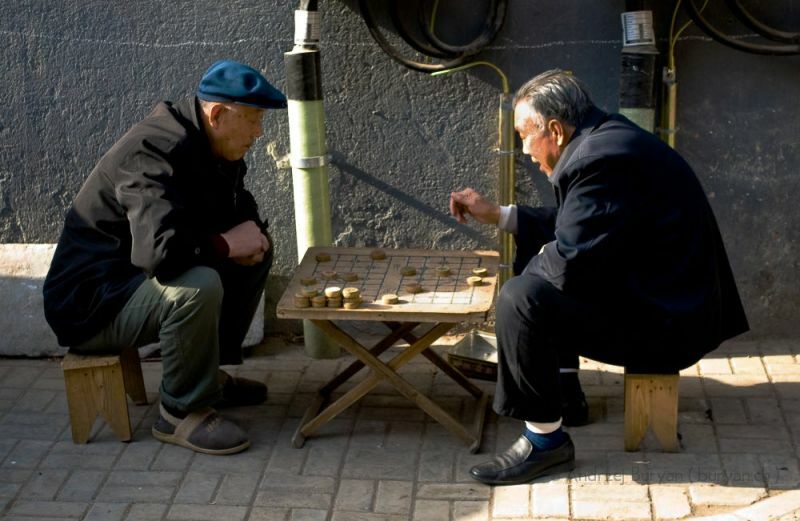 The Xiangqi game may also end if a player is unable to make a legal move, unlike in Western Chess this is a win for the opponent rather than a draw; so there are strategies for forcing an opponent into stalemate. There is also a rule to declare a draw if the same sequence of moves is repeated as in western Chess. 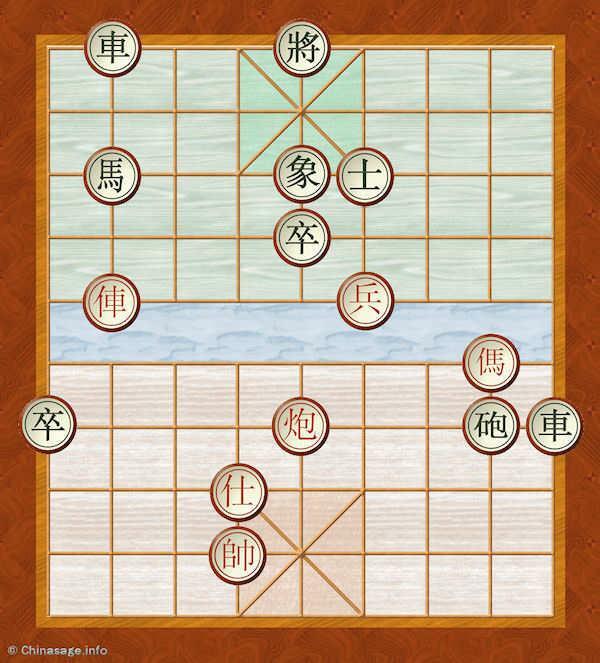 Here is a contrived Xiangqi game to illustrate the basic moves and strategies. First look at the green area above the river. The red chariot is protecting the red soldier and threatening the black horse. The black horse is protected by the black chariot. If the black horse moves up and two to the right it will reveal the threat from black to red chariot as well as protect the chariot. If red moves the soldier one step forward (up) it will threaten the adviser and soldier. The adviser would not be able to take it because an adviser only moves and takes diagonally. The black soldier would also not be able to take it because it has not yet crossed the river and can not move sideways. But note that the red soldier does not currently threaten the black soldier - a promoted soldier after crossing the river takes only sideways and forwards. In the red area below the river there are two cannons making it more complicated. The red cannon can not take either of the black soldiers because there is no piece in between. However to the right it is not threatening the black cannon but, because of this piece, it is threatening to take the black chariot on the far right. Similarly it is threatening the black elephant. The black cannon is not threatening the red horse or the red minister as there is no piece in between. The black cannon is protecting the black soldier because the red cannon is in between. The best strategy for this contrived situation is quite complex to work out. Red is threatening to take a black chariot or elephant on red's next move. Black must also try to tackle the threat of the red soldier. Black could move its right cannon back to protect its control of the place into which the red soldier would move. But black should move its chariot on the right so it is not threatened by red's cannon. It can do this counter-intuitively by moving its cannon, it could move it one step down, as at the same time the chariot would threaten red's cannon. Red would respond by moving its threatened cannon or by moving its horse two steps left and one down, thereby threatening the black chariot as there is now one piece in between them. Red can still take the lower value elephant piece with its cannon and would put black in 'check' and all sorts of trouble. Red is in a much stronger position. Which is the superior game of Chess? Compared to western Chess there are more restrictions on where pieces can move which in some ways makes it simpler as there are fewer possible moves to consider, on the other hand the additional rules for cannons and generals make it more complex to analyze. Being able to move soldiers sideways after crossing the river offers some interesting options. In western chess the dominant piece is the Queen (introduced as late as the 15th century), in Xiangqi there is no piece as powerful and this makes working out a winning strategy more of a challenge. The fact that many western players like to exchange queens as soon as possible suggests the Chinese version is superior. Some early travelers to China seem to have confused chess with checkers and considered it a trivial game. As the pieces are all small discs, someone not familiar with the characters may have made this mistake. Note: We are using the traditional form rather than the modern form of the characters for the pieces. This is because most Chinese Chess sets still use them. In addition, some chess sets use the same character for both side's scholars; cannons and horses. Citation information for this page : Chinasage, 'Chinese Chess or Xiangqi', last updated 23 Nov 2016, Web, http://www.chinasage.info/chess.htm.